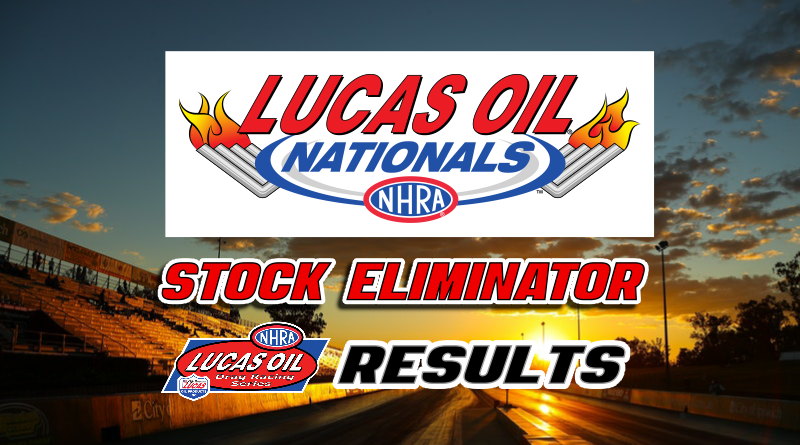 BRAINERD, Minn. – The Stock Eliminator final at the NHRA Lucas Oil Nationals featured back-to-back scenarios for both finalist. Ben Line of International Falls, Minn. was looking to win the Lucas Oil Nationals for the second year in a row while Randi Lyn Shipp made the final for the second national event in a row. In the end it was Line and his ’69 Mustang taking the heads-up C/SA victory over Shipp and her C/SA ’67 Firebird. What great way to finish an event with a pair of classic muscle cars going heads-up for the win. Line averaged a .022 reaction time over seven rounds of eliminations, including three .00 lights. While Line was good at the tree, his car was phenomenal as it was glued to his dial-in through the race and it also carried Line to the heads up win in the final. Line began eliminations with a win over his mother, Maxine Line. After both drivers posted .04 reactions, Ben took the breakout win after Maxine took about a car length of stripe to go under by .025 in the loss. Ben scrubbed a couple of hundredths to go .051 above and move on to the next round. Line used a killer .006 reaction to defeat second round opponent Glen De Menge. After a .023 starting line advantage, Line scrubbed .06 on the top end to take .033 and go .053 above his dial for the win. De Menge looked to be about .03 slow but braked at the finish to go .063 above in the loss. Line caught a break in his third round matchup with former national champion and multi-time national event winner Al Corda. Corda won the reaction time battle, .028 to .047, but lost the battle at the finish line when he decided to let Line have the stripe. Corda, who looked to be only .01 fast, killed .06 to go .055 above while Line, who couldn’t break out, took the stripe by .023 to go 10.523 on his 10.51 dial. In the fourth round, Line won a close race against Larry DeForrest. When both drivers posted .03 reactions, the race would be decided at the top end. Line picked up the .006 win after DeForrest could only run a 9.752 on his 9.72 dial. Line whacked the throttle once to go .024 over, 10.554, for the win. The fifth round produced another close win for Line. Although he drilled the tree with an .011 light, Line turned on the win light by only .004. Opponent Scott Dugdale was .024 at the tree and looked to be on a dead-on pass until he parked at the finish line to go .033 above. Line also braked hard at the finish line slowing .05 to go .042 above in taking the .004 (that’s less than a foot everyone) win. The close win in the fifth round earned Line a bye in the semifinals giving him a shot at earning his second win in a row at this event. The runner-up, Randi Lyn Shipp of Floyds Knobs, Ind., was looking to find one more win light in Brainerd than she did at the previous national event in Seattle. Shipp has had a career year in 2018 as she has been making rounds and finals all over the country. At the Lucas Oil Nationals Shipp was solid at the tree averaging a .030 reaction time but it was her ’67 Firebird that helped her reach the finals as it was glued to the dial-in throughout eliminations. Shipp won easily in the first round when opponent Brian Seaburg was .06 above his dial allowing Shipp to ease to a .036 over 10.746 win. Shipp drilled the tree with a .015 reaction time in her second round win over Michael Barrett. Barrett was .075 at the start and -.058 under at the finish in the loss. Shipp once again was able to slow to a .024 over 10.754 to take the win. Shipp won a great race against Brett Speer in the fourth round. Speer, who looked to have been holding around .07 each round, left second when his .020 was trumped by Shipp’s .007 reaction. At the finish line, Speer dropped hard giving the stripe to Shipp by .014. Shipp, who didn’t lift, posted a -.003 under 10.717 while Speer posted a losing -.005 under 10.665. Speer drove the top end well considering he was holding a ton but Shipp really didn’t leave him any room as she hit the tree and was running so close to her dial. Shipp was the benefactor of her opponents red lights in rounds five and six which setup the heads-up final round with Line. With Line already holding a two-tenths E.T. advantage based on their qualifying runs, the race was practically over at the line when Line dropped a .009 reaction time on Shipp who followed with a solid .020 reaction but needed more help if she was to out run Line’s Mustang. At the stripe, Line ran a 10.538 for the win as Shipp coasted through the finish line to a 10.679. The win was Line’s second in three career final rounds. Congratulations to the Line family on their win!